The Ankeruhr stands high at the Hohe Markt in Vienna, Austria. The clock was designed to make time stand still, in a way. It seems that human beings have forever tried to immortalize themselves. Famous Romans built statues and buildings so the next generations would remember them. European kings wanted to be powerful forever so they commissioned wall-sized, selfie-styled paintings. Rich people do the same today. People like Bill Gates, who started a foundation, so his fortune can perpetuate his reputation long after his death. A life insurance company built the Ankeruhr in 1915. The clock was a memorial for Vienna’s most powerful citizens. That’s why the Ankeruhr looks radically different than a normal clock with big and small hands, which turning around and point at numbers. Instead the Ankeruhr has a different life-sized statue for each hour, that walks across a bridge between two buildings. Over each figure’s head is a number, which is the time of the day. In total, there are twelve statues, each one a famous person in Vienna’s long history. There’s Prince Eugene of Savoy, for example, who crosses the bridge at 10. Maria Theresa travels at 11. At 12 o’clock, at noon, all twelve of the figures parade out together as a group. But even the Ankeruhr’s creator couldn’t design a clock that ran forever, which is where Robert Kalivoda enters this story. By the 1990s, the mechanics of the Ankeruhr, the gears and chains inside the clock, were falling apart. 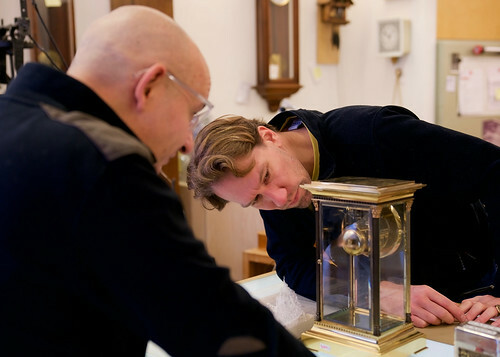 It needed to be fixed and Kalivoda – one of Vienna’s master watchmakers – was hired to bring the Ankeruhr back to life. Instead of chimes or bells, like European church clocks, the Ankeruhr was built with a unique source of sound. “When this clock was first built, there was an organ at the top and an organist would go up to play at noon. Depending on the season, he would play different tunes,” points out Kalivoda. But the Ankeruhr was designed to be much more than just a functional object. From it’s conception, it was intended to be a work of art. The Viennese artist Franz Matsch built decorative, curved lines into the Ankeruhr. 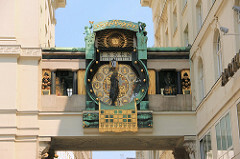 Art Nouveau was in fashion and design elements are seen in the floral ornaments and two small stone trees left and right on the clock bridge. The Ankeruhr was lovely to look at but it also told time. Most people in Vienna one-hundred years ago didn’t have a clock in their homes. Instead, they listened to the sounds chiming from Vienna’s many church clocks, so they’d always be punctual. one-room workshop. On every wall hang clocks, large and small, keeping the time. Most are interesting to look at, but more hypnotic are the sounds. The tick tock coming from so many clocks at once, all beating rhythmically together, is a kind of mechanical symphony. There are light crisp ticks and heavy metal, thud-like tocks. 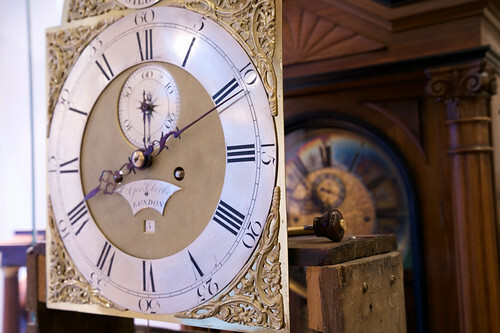 Robert and Arno Kalivoda have a few clocks in their shop which are hundreds of years old. Of course the Ankeruhr was built not only to tell time but also to perpetuate the memory of Vienna’s most important personalities. However, instead of stopping time for these historical figures, the Ankeruhr makes visible how fragile time truly is. The organ player has been replaced by a computer. The Ankeruhr’s Art Deco decorations have gone out of style. The Ankeruhr’s internal mechanics were replaced by Kalivoda himself. In fact, it’s because the clock is so outdated, that visitors like to see it. Nobody makes clocks like the Ankeruhr anymore. Even the famous figures that parade across the bridge are almost completely irrelevant today. Nobody has ever hear of the lyric poet Walther von der Vogelweide (4 o’clock), architect Hans Puchsbaum (6 o’clock), or former Mayor Johann Andreas von Liebenberg (8 o’clock). The Ankeruhr is more a testament to the power of time and mankind’s silly repeating attempts to hold on to forever. Time has even passed for Kalivoda, who retired in 2007 and turned the workshop over to his son, Arno. 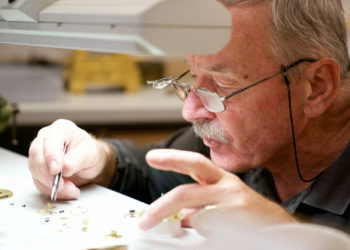 But Robert still comes almost every day to work on clocks, just for fun, because fixing a clock is like solving a puzzle. “Even at 70 I’m still fascinated. It’s too much fun to just stop,“ he says. So if time can never be beaten, what use are all the statues, paintings, Bill Gate’s Foundation and the Ankeruhr really good for?